Equity President Chloe Dallimore says the casting of an American performer in the role of Willy Wonka highlights the need for an industry-wide foreign artists’ agreement to cover musicals. The previous agreement was terminated by LPA (the member organisation for live theatre producers) without warning several years ago, and attempts to renegotiate it have been repeatedly refused. “Without an industry-wide agreement there is no consistent process when engaging foreign artists to work on Australian musicals. Some producers notify us the day before the public announcement or don’t consult at all. Others take consultation very seriously. This issue is too important for an ad hoc approach.” says Dallimore. Since the agreement was terminated, performers have regularly expressed serious concern about the number of performers being imported to work on local musical productions. In 2016, foreign performers were cast in principal roles in four major commercial musicals in Australia. “When LPA terminated the old agreement we were assured it would be business as usual and the flood gates would not open. 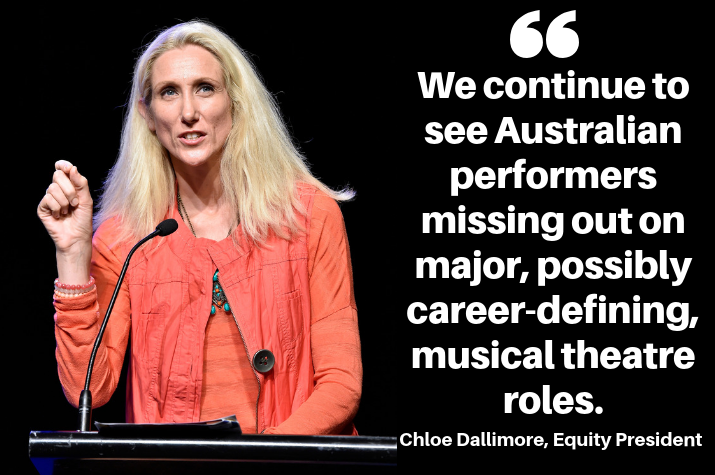 Yet we have seen many examples of Australian performers missing out on major, and possibly career-defining, musical theatre roles,” says Dallimore. Equity was not consulted about the Willy Wonka casting decision in the months leading up to a public announcement. “We’ve been depending on the common sense and goodwill of Australian musical theatre producers to consult Equity throughout the casting process. Over the weekend we were completely blindsided by the Willy Wonka announcement. We cannot accept a situation where some producers do what they please when it comes to the use of foreign artists in local productions,” says Dallimore. Following LPA’s termination of the industry wide agreement, two of Australia’s biggest musical theatre producers – Disney and the Michael Cassel Group – independently reached formal agreements with Equity on the use of overseas performers. Dallimore says it is extremely unfortunate that the Charlie and the Chocolate Factory casting announcement has been overshadowed by dismay and disappointment.